All I could do was breath sighs of relief. I arrived in Tucson ten hours late and waited at A Shot in the Dark, a 24/7 café, until the Roadrunner hostel opened for registration. It was a painful six hours trying to stay awake. The closest skate park was the Ott Family YMCA, open from 5-9pm at the cost of $10 [it has a separate entrance and the guy staffing didn’t check receipts…just saying]. Kneepads and helmets are required, but they have some on hand [mostly kids’ sizes]. 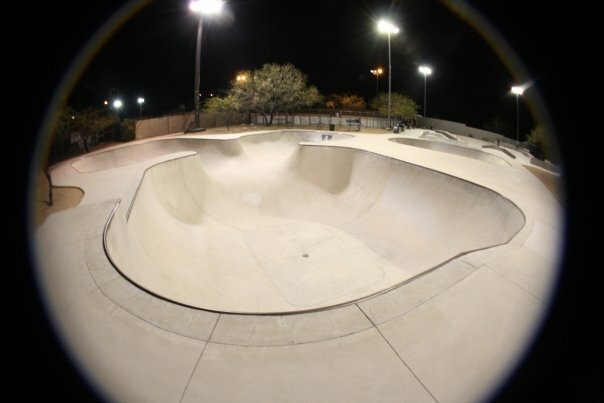 The park has a smooth cement pour with a deep combination bowl, a smaller bowl, and some lines in the street course. While I skated, Bryan, the hostel’s vegan chef, made me a plate of super tasty tacos for after my session. The next morning I hopped the Greyhound to Austin.